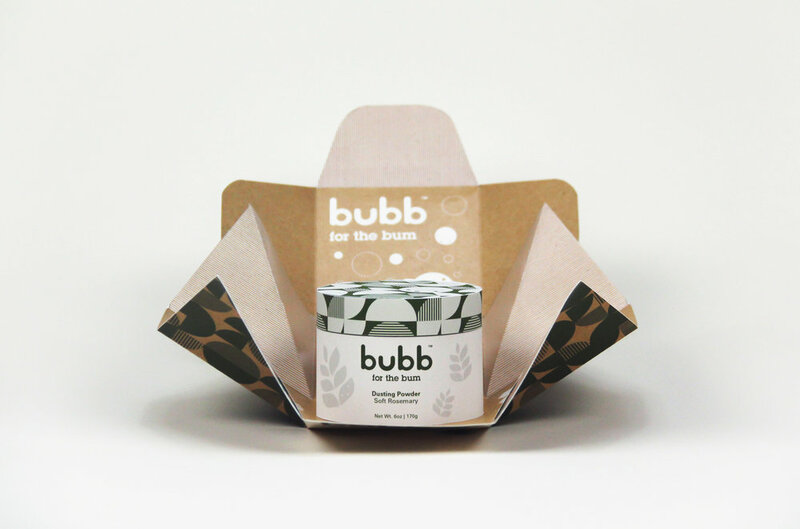 The design direction for Bubb is to create a fun bath time experience for parents of babies and young toddlers. The design is playful with the creation of a brand mascot and pattern design, and adds an element of surprise with the extension of the brand to the inside of the packaging. The darker and more subdued tones attract a sophisticated and trendy demographic. The merchandising strategy is solved within the design of the packaging. Each panel of the box has a different pattern or graphic that can be stackable in various combinations. The beginning ideation phases show jar and outer packaging variations. From the start I was interested in creating an interactive package experience that extend the brand into the inside of the container. The playful and interactive nature of the brand is integrated into the package design. The outer container opens up to reveal illustrated ingredients and engaging brand messaging.